All Society members are encouraged to come out at 2 pm on December 8 at Magruders on Fort Jackson to participate in the running of the West Point Society of Columbia before we kick back and watch Army beat Navy. 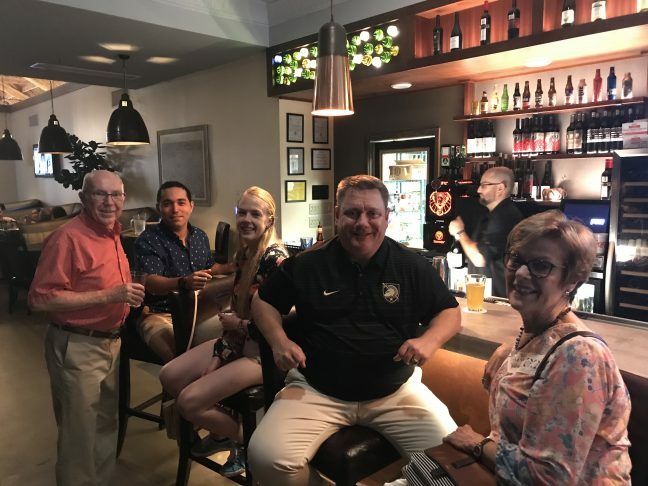 Last Friday, 27 July, a sturdy cohort of graduates young and old met for companionship and alcoholic beverage consumption (in moderation, of course) at the Grand restaurant, a new eatery at 1621 Main in downtown Columbia. The Grand sits in the space previously occupied by the old Army-Navy store. Hearty souls in attendance included Pat and Ann Canary (’62), Jim and Kelly Morris (’77), Mike Salas (’14), Jerrod Fussnecker (’04), Jack Poole (’87), and your wordsmith (sorry if I left out anyone’s name–I left early. The approach of old age continues relentlessly). And what a place is the Grand. A beautiful bar area, a dining room, and, get this: a 7 lane bowling alley in the back. And the lanes are available if you wish to roll a game or two. The menu is loaded with appealing appetizers and entrees and features seafood dishes (salmon, shrimp, tuna) in abundance. When you go, prepare to have a great time, but don’t leave home with a light wallet. Yes, it is a little pricey. But you’re not going there every night. There will be no BH hour for August as we will be meeting with the West Point Parents Club of South Carolina to stuff boodle boxes and watch the Army Black Knights beat Duke Blue Devils. Details will available here and on our Facebook page. Make sure to RSVP by August 17th so we can get a good head count! 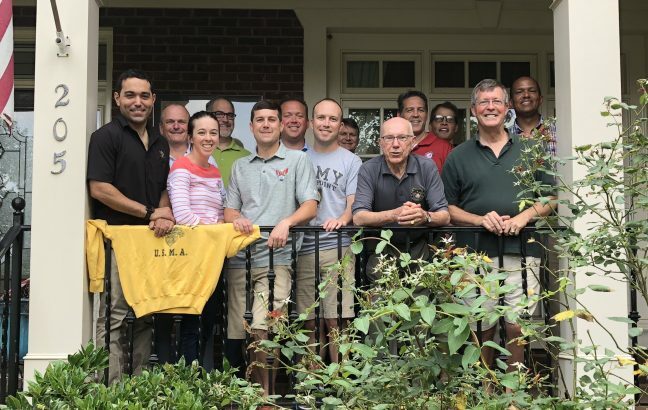 If you are looking for an opportunity to participate in one of our chief activities and community outreach programs, the West Point Leadership Award program, please read on. We present the West Point Leadership Award at participating high schools, usually at their end-of-the-year academic awards ceremonies. We provide the school faculty and administration a set of selection criteria that mirrors what we are looking for in competitive cadet candidates (chiefly strength in academics, athletics, and demonstrated leadership in school and/or community activities) and ask them to select their top student leader (junior class). We then present the recipient a certificate in a nice cover emblazoned with the West Point Crest as well as a plaque that is displayed permanently at the school. We typically present the award at the beginning of each ceremony, alongside alumni from schools like Harvard, Yale, Princeton, Washington & Lee, etc. The presenter will deliver an approximate two-minute introduction to the award, which is a great informational tool to promote West Point, its mission, and its numerous well-known graduates. Upon presenting the award, the presenter is free to exit the stage – we are not expected to stay for the duration of the ceremony. This program is a fantastic and effective way to promote West Point to students, parents, and school faculty in our community. As an admissions officer, I can tell you that we have significantly more candidates apply each year from schools where we present the awards. This is also a great way for members of our Society to be involved in a very meaningful series of events. The time commitment is small. I ask members to please contact me directly to find out more or volunteer to present an award.